Cuckoo for Coconuts: C'est le GRAND POTIRON! It's the GREAT PUMPKIN indeed. A few months ago, our electrician gave us a 17lb french pumpkin. After a few searches online, I have decided what he gave us (he is not sure of the variety either) is a Muscade de Provence. It is said to be a traditional variety from southern France. Gorgeous, big flat fruits are reminiscent of big wheels of cheese. 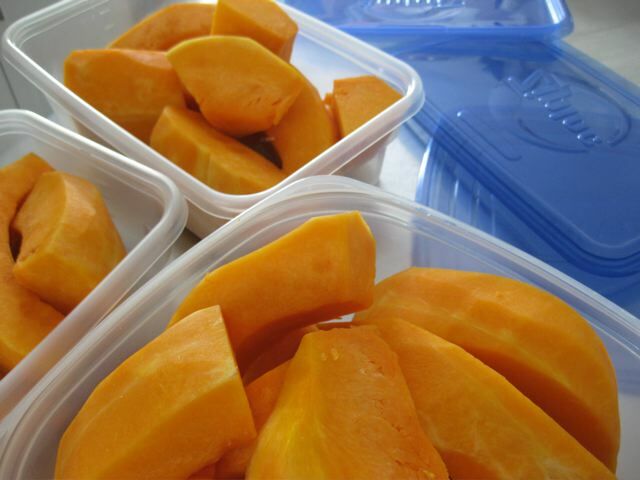 Fruits average 20 pounds, green when immature and ripen to a deep, rich brown when fully ripe. Deep orange flesh, very fine flavored. We had already roasted some of it, made some with more of it and still had a ton leftover. 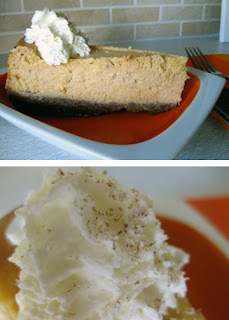 Seeing as how I am not a fan of pumpkin pie, for Thanksgiving dessert, I decided to make a pumpkin cheesecake. NO CINNAMON INVOLVED! It was quite delicious I must say. It had all the familiarity of a pumpkin pie, but was lighter in texture and flavor. Very palette cleansing in fact. Cut into cubes and steam until soft. Place into a pan, mash and cook off any extra liquid. Place into a food mill and puree. I prefer the food mill over a blender, because it gets rid of the stringy bits. Place back in pan and cook down a bit more - 15-20 minutes. Remove from heat and set aside to cool. 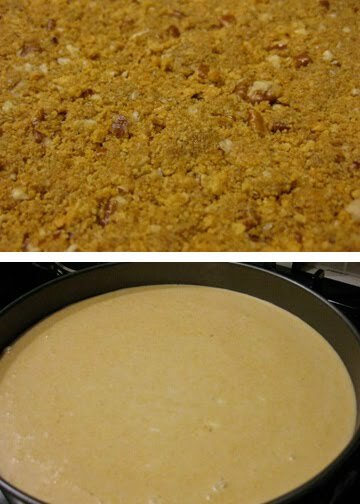 In medium bowl, combine crumbs, pecans, sugar and cinnamon. Add melted butter. Press down flat into a 9-inch springform pan. Place in 350 degree oven for 7 minutes. Beat cream cheese until smooth. 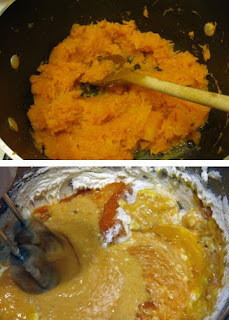 Add cooled pumpkin puree, eggs, sugar and the spices. Add flour and vanilla. Beat together until well combined. Pour into cooled crust. Spread out evenly and place oven for 1 to 1 1/2 hours. Remove from the oven and let coo. Cover with cake dome and refrigerate for at least 4 hours. Serve cold with whipped cream and grated nutmeg... or if some prefer cinnamon, you could add a dash of that as well. MMMM! I want a chunk of that hunk of gourd! 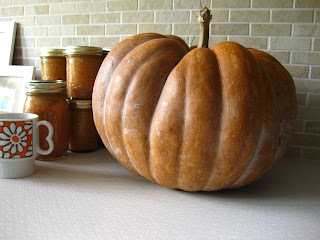 Some of my favorite pumpkin recipes are actually Japanese. 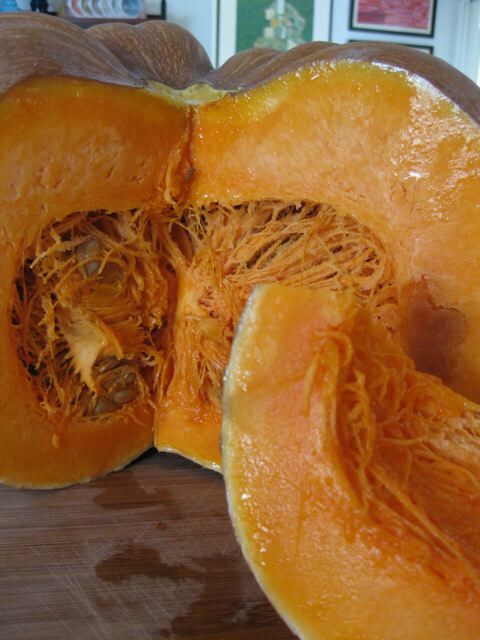 Pumpkin is a very popular vegetable in Japan. A recipe that I make all the time is Pumpkin With Sweet Sesame Glaze. Just dice the pumpkin meat into 1 inch squares. Heat 1 to 1.5 cups water, 1/4 to 1/3 cup sugar, 1 Tbsp light soy sauce in a saucepan. When it comes to a boil add the pumpkin cubes. Cook pumpkin and keep stirring once the liquid has reduced. When all the liquid has been absorbed and pumpkin is soft and sticky, turn off heat and allow to cool. Crush 1/4 cup of toasted sesame seeds and mix together with cooled sticky pumpkin. YUM! sounds great. we don't do pumpkin or squash too often... we can't get them to grow actually. they do have them at the markets quite often though. hard to make ourselves buy veggies though when we grow so many.